Can 401(k) plans and individual retirement accounts (IRAs) provide the income that retirees need to supplement Social Security and enjoy a secure retirement? Many researchers have concluded that they can. But a recent blog post by the Economic Policy Institute (EPI) takes the opposite view, arguing instead that 401(k) plans and IRAs provide “negligible” income to today’s retirees and that distributions from these plans will remain “inadequate” for the foreseeable future. It’s backward-looking. The people whose income it’s measuring, today’s retirees, haven’t enjoyed the benefits of today’s well-developed 401(k) system. In an attempt to address this concern, the March 2015 CPS incorporated changes to its survey questions, leading to substantial increases in the amount of retirement income that households reported. Nevertheless, the survey still undercounts retirement income. Looking at a pilot test of the questions from the March 2014 CPS, Biggs concluded that pension income—especially distributions from 401(k) plans and IRAs—was still underreported. EPI’s analysis is based on income reported by “seniors” (“Americans aged 65 and older”). But no analysis of today’s seniors is going to provide an accurate picture of the income that today’s workers can expect to generate from their 401(k) plans and IRAs when they retire. Today’s seniors—born before or in 1950—are not the 401(k) generation. The youngest of today’s seniors were already in their thirties and launched in their careers before the rules governing 401(k) plans were issued on November 10, 1981. They were well into their forties before the number of participants in 401(k)-style private-sector defined contribution (DC) plans equaled the number of participants in private-sector defined benefit (DB) plans. Even then, 401(k) plans were typically offered by large employers as supplements to their existing DB plans—not as the main vehicle for retirement saving. None of today’s seniors have had 401(k) plans for their full careers, and few have had them as their primary pension plan. Looking at the income of today’s retirees is looking at retirement saving through the rearview mirror. The road ahead for today’s workers will look vastly different than the road traveled by today’s seniors. Finally, the EPI analysis appears to go out of its way to minimize the reported value of 401(k) plan and IRA distributions. For all individuals aged 65 or older, EPI compares the average amount of income generated by 401(k) plans and IRAs to the average amount of income generated by other pension plans. This measure is misleading for two reasons. First, EPI averages income from each source across all seniors, rather than across individuals who actually have income from that source. As we just discussed, among current retirees, many more receive income from traditional pension plans than from 401(k) plans and IRAs—so the average pension income when spread across the entire population is almost guaranteed to be greater than the average from DC plans. Second, the EPI analysis ignores both Social Security and the crucial distinctions between private-sector workers and government workers when measuring pension income. Among those aged 65 or older, many former government workers were not covered by Social Security—and their pensions were larger, by design, because those pensions were destined to be their sole means of support. In contrast, former private-sector workers were covered by Social Security, and their pensions were designed to supplement Social Security—and thus are smaller. The figure below uses the March 2015 CPS data, but corrects for these biases in EPI’s calculations. It shows the average amount of income received by individuals who actually receive the income, and differentiates between government pensions and private-sector pensions. Note: Assets in IRAs include rollovers from employer-sponsored retirement plans. Rollovers may be from any type of plan, including both DC and DB plans, and including both private-sector and government-employee plans. In this corrected view, distributions from 401(k) plans and IRAs are indeed lower, on average, than distributions from other private-sector pension plans. 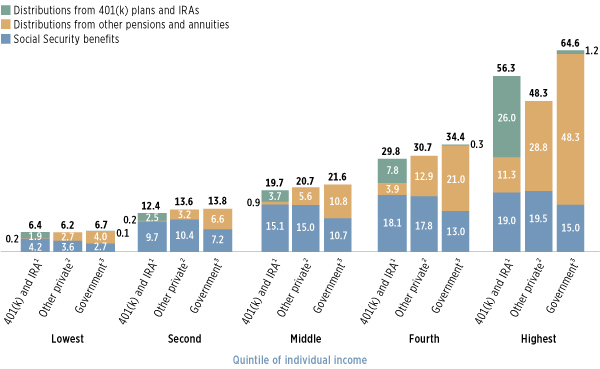 But in the middle three quintiles—where EPI claims that 401(k) plans and IRAs produce only one-ninth to one-fifth of the income provided by other pensions—the corrected view shows that 401(k)s and IRAs are providing recipients, on average, about two-thirds as much income as other private-sector pensions. And this comes from a data set that undercounts 401(k) plan and IRA income, for a generation that spent most of its career in the traditional pension system. Yet even these statistics do not tell the whole story. Retirees rely on income from multiple sources. What matters is the total amount of resources that individuals have in retirement, not the amount received from any single source. To get a more complete picture of retirement income, we calculated the average amount of income from the combination of Social Security benefits and from pensions (including distributions from 401(k) plans, IRAs, other private-sector pensions, government pensions, and annuities) for all seniors who receive any such pension income. Individuals receiving distributions from government pensions are tabulated separately (see the right bar of each quintile). Private-sector retirees (i.e., individuals without distributions from government pensions) are separated into two groups: those who receive distributions from 401(k) plans or IRAs (see the left bar) and those who do not (see the center bar). 1 Individuals are those with distributions from 401(k) plans, IRAs, or both; but no direct distributions from government pensions. Assets in IRAs include rollovers from employer-sponsored retirement plans. Rollovers may be from any type of plan, including both defined contribution plans and defined benefit plans, and including both DC and DB plans. 2 Individuals are those with distributions from other private-sector pensions, annuities, or both; but no distributions from a 401(k) plan, an IRA, or a government pension. 3 Individuals are those with distributions from a government pension. Regardless of overall income, individuals with distributions from government pensions receive more, on average, from the combination of Social Security and pensions. But because they have lower average Social Security benefits, the differences in total income are not as great as the differences in pension income alone. Among individuals without government pensions, differences between those with distributions from 401(k) plans and IRAs and those without are also not as large as those implied by looking at average distributions by source. Why is this? Because among those without a government pension, 35 percent of those with distributions from 401(k) plans and IRAs also have distributions from other private-sector pensions or annuities. This picture is very much what you would expect to see for today’s retirees—a transitional generation who launched their careers when traditional DB pensions were virtually the only retirement savings vehicle, but who got in on the 401(k) system as it took off, grew, and evolved. Even so, 401(k) plans and IRAs are making a substantial contribution to their retirement security. Looking forward through the windshield, rather than through the rearview mirror, we can expect these retirement assets to play an ever-growing role for tomorrow’s retirees.